After installing and uninstalling many applications on your system, there normally comes a point for Windows users when your system contains a lot of broken links and still contains unnecessary files which are no longer needed. With FreeFixer, you can scan your computer for unwanted junk files and display a list of the culprits. 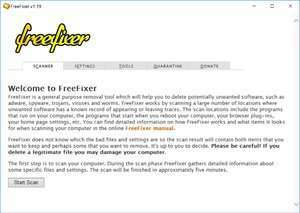 FreeFixer then offers you the option of removing these files from your system and it doesn't matter whether these files were created by legitimate programs or malware which is either still installed or removed. If you're not sure whether files should be removed, FreeFixer gives users the option to take a look at a web site which describes what the file is used for and whether it is safe to completely delete the file from your system. Version 1.19 is a freeware program which does not have restrictions and it's free so it doesn't cost anything. For security reasons, you should also check out the FreeFixer download at LO4D.com which includes virus and malware tests. Additional screenshots of this application download may be available, too. FreeFixer has a presence on social networks.